The Super Bowl is the most-watched television event in America, and this year it aired on Fox, which is also home to one of TV’s biggest hits, Glee. And because nothing screams “spectacle” like the Super Bowl and Glee, the network decided to give its already over-exposed pop-culture phenomenon even more exposure by airing after the big game. The result was what any Glee watcher has come to expect: an overblown, disjointed episode with some good moments sprinkled in among the insanity. 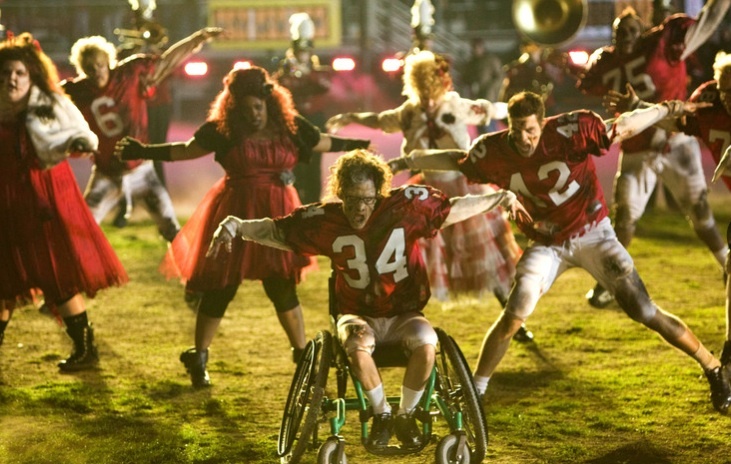 “The Sue Sylvester Shuffle” opened with a flashy, but completely unnecessary, Cheerios number set to Katy Perry’s “California Gurls,” which set the tone for the rest of the episode. Sue complained that, despite the high production value, the whole performance made her “so very bored,” to which Quinn replied, “You keep trying to make a bigger and bigger spectacle, and no matter how hard we try, we can’t make a routine work unless you find a way to make it interesting for you.” While this was another meta nod by the writers to the criticism of the show (remember the opening scene in the season premiere? ), just winking at the audience doesn’t make your show smart — it just shows that while you can hear the criticism, you don’t actually understand it (or don’t care enough to change anything, which is a valid option, considering how popular this version of the show is). Either way, the writers seem perfectly happy in continuing their show as one with little regard to ongoing plot and characterization, going for “moments” over cohesive story. I will say I’m impressed that the writers were able to elicit some sympathy for Karofsky by the end, even if it made no sense how they got there. He had been a pretty one-dimensional (maybe two-dimensional, but definitely not three) villain until last night, so it was nice to see him come around a bit to the glee club by the end. His reactions and decisions were wildly uneven, though, and didn’t fit his character as established to this point. At the start, he refuses to join the club. Then, after a compliment from Will, he suggests an opening number to Finn. Then, after a slushie to the face, he quits the football team. Then, when he sees everyone else performing at halftime, he grins, throws on a jersey, and runs onto the field. But at the end, he says there’s no way he’s joining the club full-time, because he has a reputation to protect. Wanting to win the football game was somewhat of a motivation for joining the halftime performance, but he went back and forth so extremely and so rapidly that his arc lost a lot of its power. At this point, though, he’ll probably become a series regular next season and then fall into the background, so maybe it’s not worth complaining about yet. The other problem with Karofsky’s actions, and those of pretty much every character last night, was how rooted they were in the fake high school hierarchy that somehow exists at McKinley. Sure, there are always the cool kids and the losers and everyone in between, but the way Glee has so strictly laid out its social pyramid serves only to provide a lot of false motivation for the characters. Quinn, Santana, and Brittany ditch the glee club for the Cheerios to save their reputations (until they change their minds at the last minute), the hockey team sees a chance to take over after the football guys perform one number, and then the whole football team resists joining glee club to… protect their reputations. We’ve never seen the actual repercussions of being in glee club, other than the slushies, and it seems like being in glee *and* on the football team/Cheerios is only a problem when the writers need some sort of conflict, so pushing that conflict to the forefront last night felt forced and unsubstantial. Thankfully, the episode did have its redeeming moments. Surprisingly, despite all the hype and build-up, the “Thriller/Heads Will Roll” performance really delivered, even if I don’t quite buy that the entire stadium would stand up and dance. Lea Michele put in a good performance, particularly during the football scenes, and it was nice to see her get to play a note other than “annoying diva.” Similarly, Quinn sort of became a character again, in that she stood up to Sue and reunited with Finn on a genuine emotional level (plus, it got Dianna Agron out of her Cheerios uniform and into normal clothes, in which she looked quite nice). Ultimately, though, there was so much happening that the end result was a convoluted mess. Sue, as great as Jane Lynch’s portrayal and her one liners are, is an increasingly problematic character, and last night was just a further example of her unfounded villainy (although her rampage in Figgins’ office did provide a good Will reaction shot). Katie Couric’s appearance was shoehorned in for no reason other than to have Couric on the show (and I’m not sure who in the Glee audience cares about Katie Couric). The football scenes made it impossible to believe that the McKinley team could make, let alone win, the conference championship. But, of course, those are all memorable moments, which is what the show is going for. The sum isn’t greater than the parts, but if the parts are flashy enough, viewers will keep coming. “How do I make things interesting again?” Of course, a human cannon! If Coach Beiste has won division championships at three different schools, why can’t she hold onto a job? Speaking of Beiste, Dot-Marie Jones did a good job last night, and her partnership will Will has developed nicely. “You’re not gonna try to kiss me again, are you? Where did Sam’s confrontation with Finn come from? Has he been harboring ambitions to take over the glee club for a while or something? Unnecessary appearance by the Warblers, but nice arrangement of “Bills, Bills, Bills” from the Tufts Beelzebubs. Besides the “Thriller/Heads Will Roll” mash-up, none of the music was very memorable, but I guess they can’t really do multiple elaborate performances set to expensive music in one episode. This entry was posted in Glee and tagged Glee, Katie Couric, Lea Michele, Recap, Sue Sylvester, Super Bowl, Television, TV. Bookmark the permalink.